Can be determined when the engine oil pressure caution lamp is flashing or constantly on, especially after the engine is completely warmed up. Increased clearances between rod journals and linings. Oil pump does not produce enough pressure because of the deposits on the inner parts of the pump, wear of the pump parts, oil pump suction manifold screen clogging. 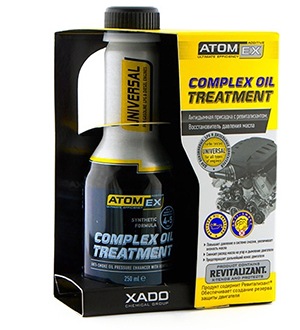 Add Atomex Complex Oil Treatment – antismoke additive with Revitalizant® to the lubrication system by uncritical increase of the clearances between crankshaft rod journals, linings and parts of the oil pump, when the engine oil pressure caution lamp is flashing or constantly on by idling engine. Also introduce the engine oil system cleaner XADO VitaFlush into the lubrication system at the rate of 100 ml to 1L of motor oil and drive 435-620 miles. Then change the oil and the oil filter and, if necessary, add one of the above products for the temporary increase of the oil pressure till the completion of the restoration of the parts with XADO Revitalizant®. Then conduct the full treatment of the engine filled with the new oil with XADO Revitalizant® for restoration of the worn linings and crankshaft rod journals and normalization of the oil pressure: XADO Revitalizant® for diesel engine or XADO Revitalizant® for gasoline engine (depending on the type of the engine); XADO 1 Stage Revitalizant®; XADO АМС Maximum. After the full treatment and 2,500-3,100 miles of run the uncritical wear of the linings, crankshaft rod journals and parts of the oil pump compensates completely and the oil pressure normalizes. Oil is diluted by the fuel or cooling agent. 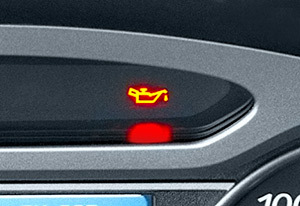 In case of the motor oil dilution by the fuel because of injector or injection nozzle dysfunction the caution lamp flashing appears at idle. It is recommended to add into the diluted oil one of the following products: Atomex Complex Oil Treatment – antismoke additive with Revitalizant®. At the same time add to the fuel tank one of the following cleaners for fuel systems according to the type of the engine (diesel or gasoline): Verylube Complex fuel system cleaner (diesel or gasoline). After the fuel with cleaner is used introduce Revitalizant® EX120 for fuel equipment or Revitalizant® EX120 for diesel engine, Revitalizant® for fuel equipment. Cleaning and treatment of the fuel system with XADO Revitalizant® allow restoring normal operation of injectors or injection nozzles and preventing penetration of big amount of fuel into the motor oil. By fuel dilution with the cooling agent disassembly and repair of the engine are demanded. Low oil level in the engine lubrication system. In case of low oil level fill up the oil up to the goal. High resistance of the oil filter. By decreased pressure due to high resistance of the oil filter install the oil filter of the recommended type. Breakdown of the oil pressure sensor. In case of the oil pressure sensor breakdown, the sensor should be replaced. Sticking of the oil pressure reducer in the engine lubrication system in the open position. Stuck oil pressure reducer should be replaced. By extreme contamination of injectors in the gasoline engines, the effective cleaner XADO MaxiFlush is recommended. It is used as a cleaning agent for flushing on the stand or as an additive for fuel injectors cleaning during operation.